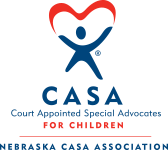 Nebraska Court Appointed Special Advocates (CASA) Association is a network of 22 community-based programs that recruit, train and support citizen-volunteers to advocate for the best interests of abused and neglected children in courtrooms and communities. Volunteer advocates—empowered directly by the courts—offer judges the critical information they need to ensure that each child’s rights and needs are being attended to while in foster care. More than 1,500 children in Nebraska are waiting for a CASA volunteer as of December 31, 2018. Children with a CASA Volunteer are more likely to get more and better services and find a safe, loving, permanent home more quickly. 2,046 children were served by 824 CASA volunteers in Nebraska in 2018. CASA volunteers are trained citizens who are appointed by a judge to speak in court for the safety and well-being of abused and neglected children. Children with a CASA volunteer spend an average of four fewer months in out-of-home care than children without a CASA volunteer.